Tattoos are definitely here to stay, despite the fact that they are incredibly hard to take off, they have become an integral part of popular culture. Almost every artist out there is sporting some body art and the King of country music is no exception. So without further ado, here is all we could glean on Blake Shelton’s tattoos. On a very good day, most of the tattoos we read about have some deep, hidden even mystical meaning. Unfortunately for Blake, but fortunately for worldwide humor, his tattoos do have a meaning, but it is not as deep as you would guess. The country singer can forge a good ballad, using the power of his mind and his God-given talent, but when it comes to designing tattoos, he should leave that to the professionals. On his forearm, the artist has a piece of body art which he has referred to as ‘one of the crappiest tattoos in the world.’ It is actually two separate tattoos combined and here’s how we know. 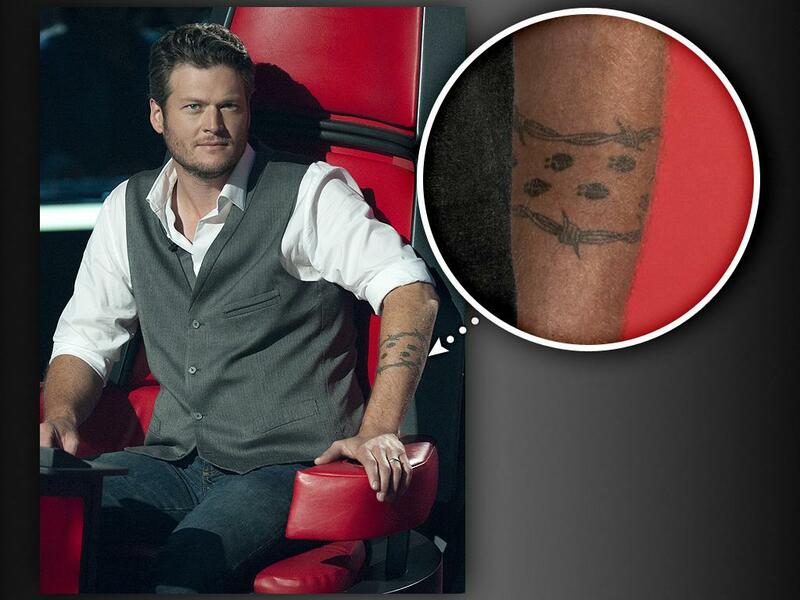 Blake has explained that, the tattoo was actually meant to be deer tracks, but up until date, people boldly walk up to him and say, ‘Man, ladybugs… that’s cool. What does that mean to you?’ It probably stings more because he drew it himself, not all of it, just one ‘ladybug’. The whole story came out when Oprah sat down with the cast of ‘The Voice’, a show on which he is a host, and believe me the story behind Blake Shelton’s tattoo was raised an addressed. When Oprah asked what Blake Shelton’s tattoo means, he was quick to answer, ‘It doesn’t mean crap, Oprah.’ He was explaining to her that it wasn’t deer poop as earlier mentioned by his fellow tattooed host, Adam Levine. He then went on to explain the inspiration, which involves his Oklahoma heritage and his love for deer. Nevertheless, one drunk night and an even drunker tattoo artist landed him with several deer tracks that look like lady bugs or according to Adam Levine, deer poop. Blake is smart, so without going on the show, ‘Tattoo Nightmares’, he fixed the problem, or did he? We’ll let you be the judge of that. The artist later had the barbed wire added to make it look more manly. So you see, it’s two tattoos, not one. Apart from his matrimonial home with his ex wife, Miranda Lambert, Blake has a couple of digs up his sleeves. Apparently, the artist built his new home, which is only an hour away from his hometown of Ada, Oklahoma. Besides the stunning natural scenery, the 1200 acre ‘Ten point ranch’ sits on the bank of Texoma, which crosses the state line between Oklahoma and Texas as the name implies. The house also features a private dock at the end of the large garden, and a balcony that overlooks the lake. When he is not in Oklahoma, the artist is at his Beverly Hills rental, which has been compared to a frat house. This is because the house doesn’t meet Hollywood’s standards of ‘glamor’ and ‘sophistication’, but Blake is just doing him. The house is bare, empty and unfurnished, but we doubt he minds, considering he spends most of his time over at his recent girlfriend, Gwen Stefani’s, place. Also, his real home is in Oklahoma and his only use for this one is to keep a roof over his head while he is filming ‘The Voice’. As such, he does not bother himself with the seemingly unnecessary duty of sprucing up his ‘crash pad’ up. As recent as last month, it was revealed that the star is building a Hawaiian-style lake house as a wedding gift and family getaway for his rumored bride-to-be, Gwen Stefani. The getaway is located in Blake’s home state of Oklahoma, so he’s bringing his vacations home. When the couple, whose rumored wedding will be taking place before the year runs out, do settle down, it’s obviously going to be in Oklahoma. Blake has taken his lady friend to his hometown and to his fabulous ranch. The locals have already fallen for her and some even prefer her to his ex, Miranda. On the other hand, several people are beginning to miss their peace and quiet. No doubt a celebrity couple moving nearby, makes the town a beacon for attention and the dreaded paparazzi. Blake Shelton net worth is currently estimated to be about $60 million, most of which he made from his music career.